KIEV, Ukraine -- A defining feature in the diplomacy of Russia’s president, Vladimir Putin, is to keep everyone guessing—because he can use doubt to magnify his threats, conceal his weaknesses and gain the initiative. Can Putin ever be trusted? That was the effect of his words on May 7th, one of the few public occasions he has spoken formally about the crisis in Ukraine. Mr Putin urged the pro-Russian separatists in the east of the country to postpone the referendums they planned for this weekend. He said that he saw Ukraine’s presidential election due on May 25th as a “step in the right direction”, contradicting his own foreign minister, who has repeatedly called it absurd. And he reported that he had ordered Russian troops to pull back from the border. A few welcomed this as the turning-point in a crisis that has now escalated into a low-intensity war. It is to be hoped that they are right. But many more, including this newspaper, will greet Mr Putin’s words with due skepticism. Throughout the crisis, Russia has said one thing and done another. Even as the diplomacy takes its course, the West must sustain its pressure on Russia and its support for Ukraine. 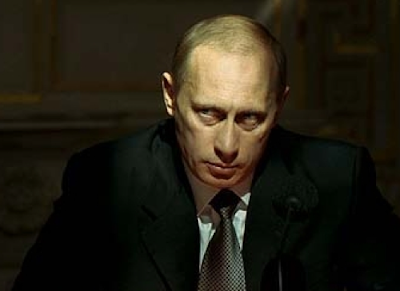 The starting point is to gauge whether Mr Putin means what he says. He has promised Russian troop withdrawals before only to fall short: this time the retreat will need to be unambiguous. Actions in Ukraine count, too. Rather than continuing to incite the pro-Russian separatists, Mr Putin must be seen to use his influence to broker peace. But the most revealing test of his sincerity will be Russia’s media, which have been doing their bit for the Kremlin by pouring out anti-Ukrainian propaganda, on a daily basis. They must now cease their relentless warmongering. Suppose that the Kremlin passes these tests, what then? Until now, Mr Putin seemed bent on fomenting confrontation in Ukraine—with the threat of Russian invasion kept in reserve. He has two reasons to step back. One is the increasingly burdensome sanctions that are beginning to damage the Russian economy. Possibly even more troubling for him is the mounting death toll in eastern Ukraine. The fighting is taking on a hideous momentum, sapping Mr Putin’s ability to use his influence over eastern Ukraine to wreck the government in Kiev. Instead, Russia risks being sucked in to the conflict, in order to honour the guarantees of protection that it has given its supporters. Although the threat of invasion is useful for him, actual occupation would involve huge costs. The sight of Russian and Ukrainian troops slaughtering each other would puncture Mr Putin’s popularity at home. Much better to keep Ukraine smouldering than to have it burst into flame. Mr Putin seems to be hoping that a grateful world, desperate to avoid conflict, will agree to what he has sought all along: a federation of Ukraine that blocks it from moving towards the European Union and NATO, as well as the uncontested annexation of Crimea. The world should not oblige. Ukraine will need to give more autonomy to its regions—but not such power that they can veto foreign policy. The West must give Ukraine aid and as much advice as its government will take. Mr Putin can turn the pressure on Ukraine back up just as easily as he seems to have turned it down. He has not relinquished Crimea, and his treatment of Ukraine has betrayed the nature of his regime. Therefore, the West should maintain today’s sanctions—and the threat of more. It should strive to lessen its dependence on Russian energy and face up to the fact that, while Mr Putin is in power, doing business with Russia will be perilous. After all, would you trust the man who started a fire next door merely because he has suddenly offered you a bucket of water?